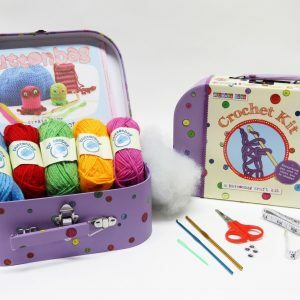 Here you will find our lovely range of Crochet Craft Kits. 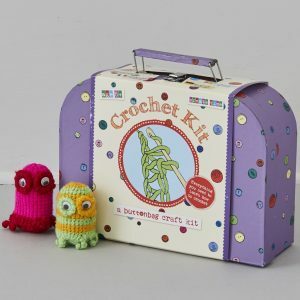 We carry a range of craft kits suitable for all pockets in our shop in Leek, Staffordshire. These include – Kits from The Crafty Kit Company, plus Amigurumi animal kits from Hawthorn Handmade. We also sell a fab range of books on crochet with some brilliant projects in them! (These can be found in-store only). Don’t forget we also sell lots of scrummy wool and all the bits and pieces you need to make lots of crochet projects if you cannot find a kit you want. We sell most of these items online but please contact us if you cannot see what you are looking for. We offer free delivery on orders over £40 and a click & collect service from our shop in Leek, Staffordshire. Express shipping is also available. 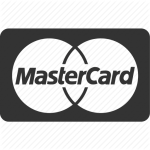 If items are listed as out of stock we may still have them in our shop so please contact us to check availability. Crochet the prettiest, vintage style, baby girl hat and bootees. The kit includes everything you need and the finished items will fit a bonny babe of 6 to 12 months.